Heat 1 teaspoons oil in a pan. Add 1 Teaspoon garlic and Chopped green chilli and saute for 1/2 minute. Add Spinach and salt. mix well and cook till dry. Remove from heat and set aside. To Make Kofta, combine potatoes, salt, grated paneer and corn flour in a bowl, mix well and divide into equal portions. Stuff each portion with palak stuffing and shape into balls. Deep fry koftas till golden and drain on absorbent paper. Heat pan. Add tomatoes, garlic, ginger, red chilli powder, butter, cashew nuts and 1 cup water and Stir to mix, cover and cook for 10 to 15 minutes or till tomatoes are soft. When tomatoes become soften, add salt to gravy and mix well. Remove from heat and blend well. strain the gravy back into a deep pan. Put the pan on medium heat, add kasuri methi powder, garam masala, mix well and bring to a boil. Add honey and cream. mix well, cook for 1 to 2 minutes. Switch of the flame. 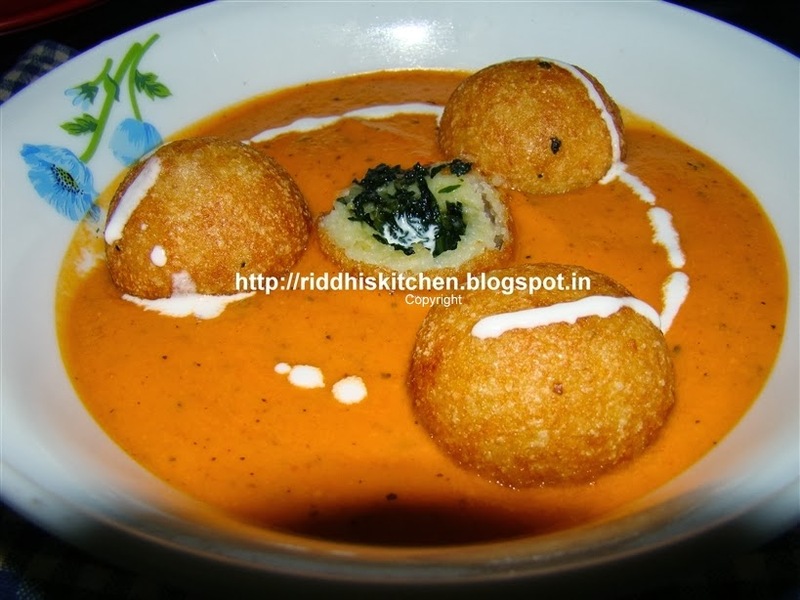 Serve Koftas along with the Makhani Gravy.